Fishtank Friday: AquaDom | OhGizmo! 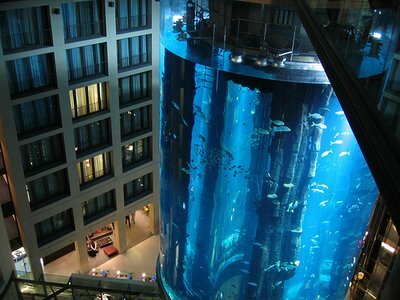 The Radisson SAS Hotel in Berlin is (for some reason) home to the largest cylindrical fishtank in the world. 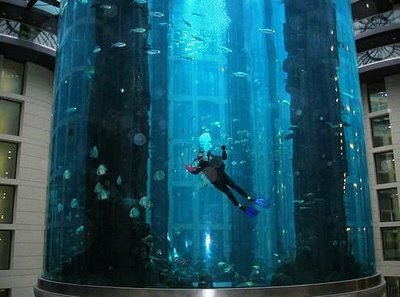 The AquaDom is 25 meters high (that’s over 80 feet), contains 1 million liters (260,000 gallons) of salt water, and is home to 2,500 fish (56 species in all). There’s also a glass elevator that goes up the middle if you want to swim with the fishies without getting wet. Two full time divers are tasked with keeping the residents healthy and happy, which might sound like a fun job, but I bet they have to keep the glass clean as well. 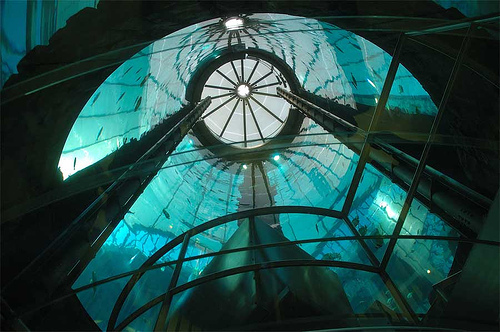 In addition to being the largest cylindrical fishtank, the AquaDom is also the largest acrylic glass cylinder in the world, with a diameter of 11 meters. The whole thing cost nearly 13 million euros back in 2003, but you can book a fishtank-view room in the hotel for considerably less than that (about 260 euros on a weekend). More pics after the jump. Wow! A Way to set off your fears of heights, drowning, and tight spaces all in one! Salt water aquariums don’t need cleaning of the glass iirc. Of course marine tanks require the walls cleaned. Algae builds up just as much as freshwater ones. Just a different species of algae. Why don’t they just use marine snails to clean the inside? There is no obvious evidence in the article that divers really have to clean the glass walls. But even though if there are some species cleaning the algae, those species would dump as well.